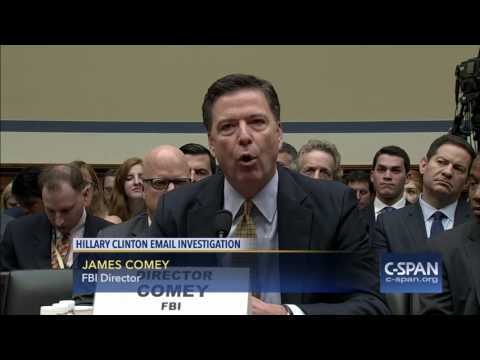 In Thursday's "emergency" congressional oversight hearings, FBI Director James B. Comey was questioned about his Tuesday, June 5, Statement reporting the Bureau's conclusions from its long-pending investigation of Hillary Clinton's "Use of a Personal E-Mail System." Trey Gowdy, (R- SC), a former federal prosecutor, walked Comey through the lies that Clinton told his Benghazi Committee in October, which evoked an on- the-record FBI endorsement of several counts of a potential criminal indictment. One wonders whether the FBI will investigate whether Clinton intentionally lied to Congress at the same speed and level of competence that even non-lawyers on the oversight committee were able to effectively criticize about the FBI's first limited investigation of the subject. After virtually framing the indictment of Clinton for lying to Congress, Gowdy then delivered a Socratic lesson to Comey on the subject of how such "f alse exculpatory statements" by Clinton, along with Clinton's pervasive and " complex scheme that was designed for the very purpose of concealing the public record" could have been used to prove her criminal intent for the email case. Gowdy completed his attack on Comey's central evasion for not indicting Clinton by instructing him that intent is rarely proven by direct evidence, as Comey's Statement seemed to suggest. "You have to do it with circumstantial evidence," he said, such as that which Gowdy outlined in less than five minutes for Comey. This initial examination of Comey by Gowdy and other committee members supports the suggestion that Comey's formal statement denying Clinton's criminal intent, quoted below, constitutes one of a series of "coincidental shams and deceptions deeply rooted in a corrupt political system." This sham includes the extended delay and timing of what appears to have been a superficial and artificially limited investigation, the unethical ex parte meeting between Comey's boss and Bill Clinton at the Phoenix airport, Obama's endorsement and campaign stop with Clinton timed to deflect attention from the FBI's criticism of her "carelessness," and then the very nature of the Statement itself, both its being made public and its straying beyond its proper duties and expertise, which is to investigate and prepare evidence of crime and not to either prosecute or instruct prosecutors on what the FBI thinks might be reasonable conduct for prosecutors. The FBI does not prosecute, does not evaluate or fire prosecutors. It investigates. It is not its job to tell prosecutors how to do theirs, but rather provide the investigation needed for prosecutors to make legal decisions based on the facts. Jason Chaffetz (R- UT) called out(3:34) how unprecedented it was for Comey to go public with such a statement, and then also to do so about more than just the facts but also to pre-judge the legal questions about prosecution. A formal FBI opinion that what was otherwise a crime should not be prosecuted because of insufficient intent, was not only a misinterpretation of the law, as discussed below. It might also have potentially prejudiced any future prosecution the DoJ might decide to undertake. This unprecedented announcement violated the general rule that one does not speak publicly about pending litigation because it can distort due process. It was dramatically improper. It is one reason why Comey should be fired. It arose out of the context where Comey's boss had said she would abdicate to the FBI her duties to make the legal and political decision on the Clinton case, rather than simply recuse herself for her ethical lapse in holding an ex parte meeting with a target of the investigation. By making the legal decision rather than properly leaving the decision to DoJ lawyers, Comey clearly did a political favor not only for Loretta Lynch but also for Barack Obama. They otherwise would have had to take political responsibility for an unpopular political decision to effectively pardon one's endorsed successor with the agreement of the other's possible future employer. Comey was able to make a political decision appear to be a technical decision, based on his peculiar views of the evidence necessary to prove intent. But as Gowdy has just begun to instruct Comey, this technical decision about intent failed to take proper account of the inferences to be drawn from the evidence that does show Clinton's intent to break the law. It was also a wrong interpretation of the law of intent, as discussed below. For example, Clinton clearly intended to give classified information to her lawyers who did not have security clearances, as well as allowing her uncleared tech support to have access. Comey had no good answer for these facts. Among the many lapses of judgment that Comey defended he did not think it germane to an assessment of her intent that Clinton refused to be interviewed by the DoS inspector general. Comey's refusal to comment on the existence of a Clinton Foundation investigation suggests that, contrary to speculation, it was not part of the email investigation. But that would overlook a potential motive for Clinton's prioritizing the secrecy of her private affairs over the nation's secrets that would have been far more nefarious that the motives than Comey approves for prosecution, such as whistleblowing. After reciting facts that have long been known to the public, and that contradicted lies told by Clinton, the FBI's operative finding delivered by Comey was that "we did not find clear evidence that Secretary Clinton or her colleagues intended to violate laws governing the handling of classified information." In the oversight hearing Comey did not demonstrate a full grasp on facts, such as who paid for Clinton's server. So his formula that he did not "find clear evidence" was less than convincing that he would have found it.